I turned 48 last week. At this point in our lives, we have 4 adult children: 3 who live independently and 1 in college who spends summers and school breaks at home. That leaves 4 kids at home full-time, and means an inconsistent showing of our kids at family meals and other special events, like my 48th birthday dinner. For this little birthday celebration, we had 4 of our 8 kids present plus one French house guest. Lately, we've housed several French guests because God put them in our path years ago and the relationships continue to grow. This ring, though, is what I need to tell you about, because our Mighty Joe—the brain-damaged 10-year-old—wrapped it up in a piece of black construction paper adorned with his own artwork of a train done in white crayon, and presented it to me after dinner. 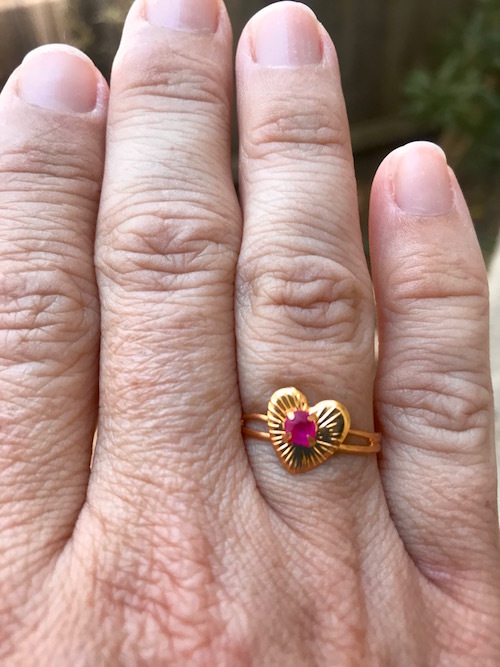 After I dramatically declared my love for the tiny heart with the faux red ruby, Joe needed to let me know how he came by it as my birthday present. "Daddy gave me a quarter. I wanted to buy gum but then I saw the ring and bought that for you instead." "If Daddy had given me two quarters, I could have bought you the ring and the gum." Well, there it is. Honesty. Out of the mouths of babes and all that. But I often treat God this way, knowing that he's given me a gift to give to someone else, only to turn and wish he'd given me something I obviously wanted from him instead, or in addition to. I'm happy to give to others, but most of the time I think I'd be happier if I got to keep something for myself, as well. I mean, if I'm being as honest as Mighty Joe was the night he gave me the ring with the tiny heart. And again, this is why I need Jesus. It's the theme of my life. I wish I could tell you my heart is purer than that, but the truth is, without the perfect heart of the Savior standing in my place, it's just about as valuable as a ring bought for a quarter out of the machine in the grocery store. What made that ring valuable was the giver. What makes my own heart and your own heart so is the giver. And his gifts are always, always, always the best. Join a gracious community of people who love Jesus. Older PostWhat If I Can't Find My Calling in Life?